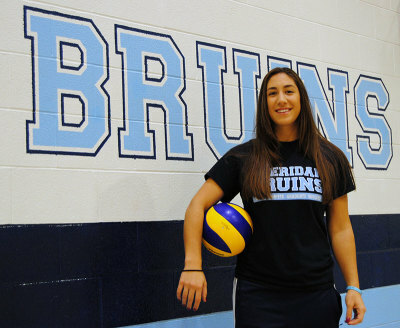 Melissa Cappelletti was built for volleyball. Tall and slender, with natural power and tremendous athleticism, the fourth-year Bruin is the epitome of the volleyball player physique. So it only makes sense that she decided to play volleyball, right? “I stumbled into volleyball almost by accident,” said the 22-year-old right side. The rest is history. The fourth-year Athletic Therapy student is enjoying a career-season this year, leading the OCAA in kills (109), kills per set (3.52) and points per set (4.3) through eight matches. Her personal narrative parallels that of her team’s, as the lady Bruins are off to a surprising 6-2 start and are sharing a piece of second place in the OCAA West division: A stunning turnaround from their dismal 3-15 record last year. “We have a really good group this year,” said Cappelletti, who is quick to deflect attention from her own success to the team’s. And she’s built quite a résumé to reflect her prowess on the court. Her trophy case includes an OCAA West Division Rookie of the Year award, a Sheridan Female Athlete of the Year award and she was named a 2nd Team OCAA All-Star. Oh, and she’s also a two-time team MVP. But that doesn’t mean she doesn’t have an upbeat perspective. It takes all of five seconds with Cappelletti to recognize her engaging, genuine and bubbly personality. Third-year Athletic Therapy student and teammate Jordie Bevan agrees that Cappelletti’s attitude is “always positive” and she’s constantly “there to help”, but phrased it uniquely. “She’s always filling our buckets,” said Bevan. At the beginning of the year, head coach Scott Hunt provided his players with an article describing two types of people in group settings: energy-givers and energy-takers. Givers fill the bucket, and takers empty the bucket. Bevan says Cappelletti’s a giver. In terms of her personal energy, however, Cappelletti describes balancing her school and volleyball schedules quite draining. She lives in Cambridge, has class at Davis, and practises and trains at Trafalgar. Her average commute is a couple hours each day, and her team’s training and yoga programs run for roughly three hours a week. And that’s not even including games. “It takes a lot out of your day,” Cappelletti said. Cappelletti’s focus now rests on the second half of the volleyball season starting in the winter semester. Added by spencerluyben on December 2, 2014.